No matter how creative, memorable, or popular your content pieces may become, every asset you create and share will ultimately be judged by the impact it makes on your business’ bottom line. 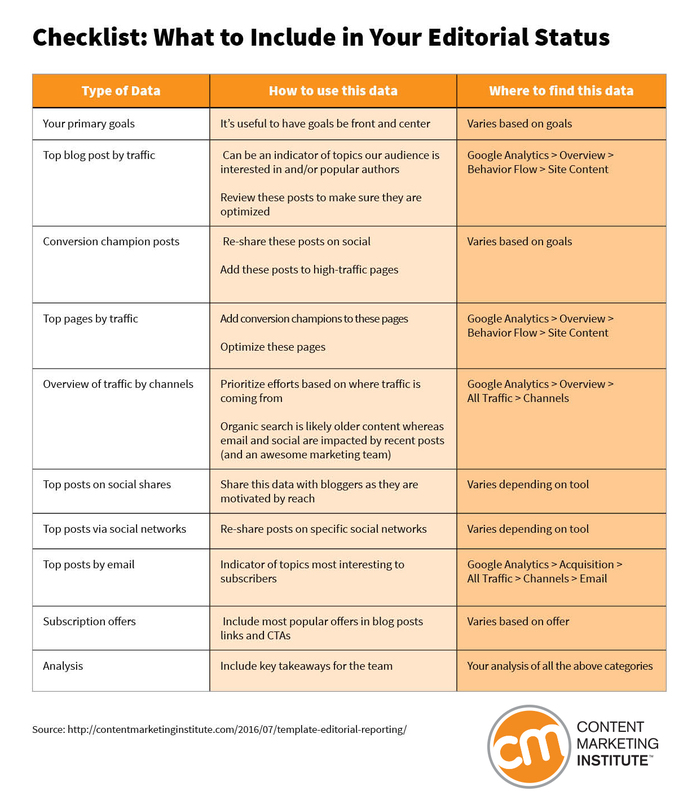 While it can be tempting to think about measurement only after all other tasks are complete, you should recognize by now how critical it is to have the right data on hand to inform every phase of your content marketing approach. That is why it’s a good idea to establish sound measurement practices from the start of every program, enabling you to track, analyze, and optimize your content’s performance on a continual basis. But, of course, just because something is a “best practice” doesn’t mean it’s easy (or possible) to achieve in a real-world setting. Fear not. Even if you’ve been creating and distributing content for a while, it’s never too late to implement the measurement techniques to identify what’s working, discover areas where improvements can be made, and determine where to scale back to concentrate on more impactful efforts. Once you master the basics and your program grows more sophisticated, you can expand your focus to incorporate additional data points – and more advanced analytics techniques – into your measurement efforts. If you’ve begun to publish valuable content and look to put a more formal measurement plan in place, the first steps are to identify, qualify, and categorize your existing assets. After all, you can’t measure it if you don’t know you have it. First, you need to create a content inventory – a quantitative list of the assets published across content types, channels, and distribution formats. From there, you may want to conduct a full content audit – a qualitative evaluation of your inventoried content – to assess your existing content against your customer needs and your strategic objectives. Not only can these processes help you understand your content’s strengths, weaknesses, and overall strategic alignment, they can also reveal any gaps that might exist in your coverage as well as areas where your content needs an update – all of which could keep visitors from converting. Take a shortcut: Want the insights from a full content audit without spending months of your time? Check out How to Do a Content Audit in a Few Hours. An increase in the number of qualified leads entering the sales pipeline? A greater share of voice among your competitors? Enhanced brand awareness or sentiment among potential customers? Knowing where your company’s priorities lie is essential to determine which goals to focus on for your measurement efforts. You also need to know which key performance indicators (KPIs) to track as evidence of your content’s impact. 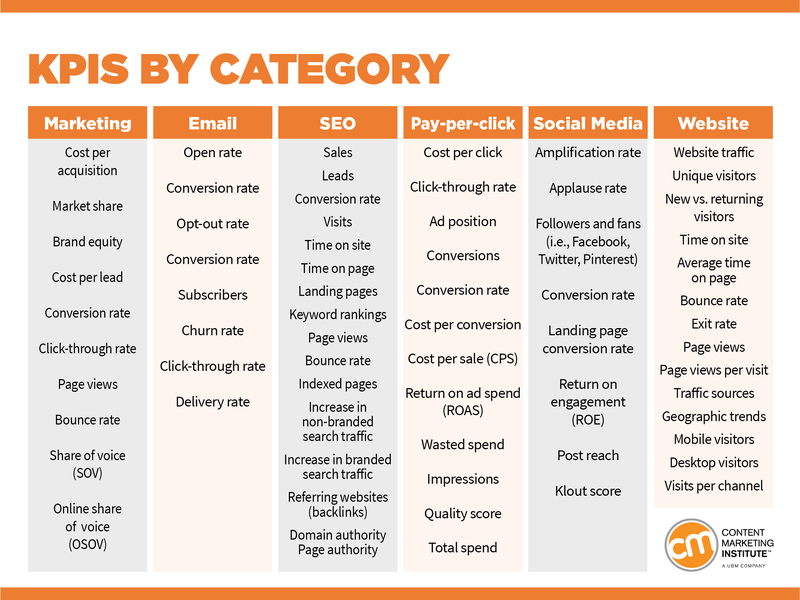 Use the chart below to get a sense of critical KPIs you should be tracking in pursuit of common content marketing goals. While it’s important to gather quantitative data to validate your content’s value, you can also gauge your content’s impact by listening to the conversations around your brand ­– including social media conversations. This direct, unsolicited feedback can be invaluable to understanding whether your content is reaching the right audiences, how well it’s being received, and what you can do to increase the value of your publishing efforts. 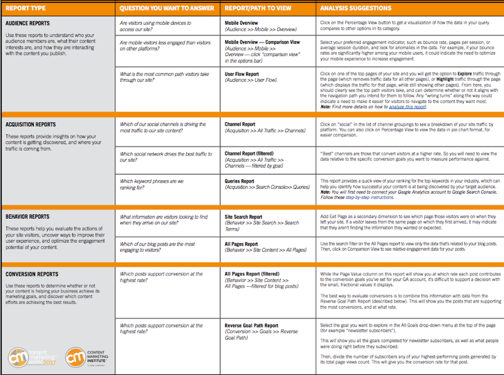 A content review template, like the sample below, tracks relevant social media conversations and documents any analysis you extract from listening activities. Your content doesn’t exist in a vacuum. Every new asset must draw attention from something else your audience might want to pay attention to. A competitive content marketing analysis of your industry peers, including how well their work is performing, can give you a fuller picture of where your audience’s needs are being met and where opportunities exist to steal mindshare from other businesses. Content marketing measurement isn’t a one-time effort, it’s an ongoing process. And, like any process, having the right tools, techniques, and templates can be invaluable in organizing the data, identifying key opportunities, making meaningful changes, or reporting results to your stakeholders. When putting your measurement program in place, decide how frequently you’ll collect your data. Do it too often and you might not allow enough time for meaningful patterns to appear; but if you wait too long, you run the risk of overlooking problems that could keep your content from reaching its goals. For example, CMI’s Cathy McPhillips recommends tracking performance on a monthly basis to start, then adjusting your timeline as necessary. Use the spreadsheet template below to keep an eye on your goals, KPIs, and the metrics you are tracking in your evaluations. Once you choose the performance indicators most meaningful for your business, you want to track the performance of every content asset you publish against those benchmarks. Building a dashboard where you can display all your data in one place on an ongoing basis makes it easier to identify performance outliers (both good and bad), as well as report your results to your supervisors and stakeholders. Dashboards can be created and customized in many ways and, with the right tools, you can get granular. But this simple measurement template from NewsCred (via Michael Brenner) can get you started with a broad view of how your content performs against common metrics over a trended time. And, as your analytics capabilities grow more sophisticated, you can build it to include additional data points. A basic dashboard like the one above is a great way to manually aggregate and evaluate your performance data. But more robust analytics tools are available to provide deeper insights, including solutions that automate common measurement tasks for easier ongoing analysis, as well as those that correlate findings across multiple content platforms. Once you have your performance data on hand, it’s useful to keep your team members, executive management, and other content stakeholders regularly informed about the progress your program is making. Here is a checklist for creating a simple editorial status report, which you can use to share key analytics and insights on an ongoing basis. Having the right data at your fingertips won’t do you any good if you don’t understand what the stats are telling you or know what to do in response. Following proven best practices for analyzing your results and turning those insights into action helps you spend less time staring at abstract data on your screen and more time addressing the meaningful opportunities they reveal. The standards for considering a piece of content to be a “success” can vary widely project to project and purpose to purpose, as well as by organizational goals and processes. It can be hard for content marketers to determine whether an existing asset is performing to expectations. It’s helpful to use a consistent methodology or content scoring system to enable your content team to make apples-to-apples qualitative assessments. By assigning a standardized numeric value to each of your KPIs, you can get an at-a-glance view of the relative benefits each content effort brings (or is likely to bring) to your business. Google Analytics is practically synonymous with basic site visitor metrics like page views and bounce rates. But this robust tool can also be mined for the kind of deeper, more actionable insights that lead to smarter content choices – if you know how to access them. To start using Google Analytics as a decision-support tool, follow the simple, five-step process outlined by Orbit Media’s Andy Crestodina. You can also refer to CMI’s handy applied analytics guide to learn more about the analytics reports that can answer some of your biggest content performance questions. The aggregated, trend-focused data from Google Analytics can help you see the big picture of your content’s performance. But if you want to learn why certain content assets are achieving better results, you may want to measure their impact on a more individualized level. For example, by adding marketing automation tools and CRM systems to your analytics arsenal you can collect information on how specific users engage with your content and the actions they take afterward. Then, by correlating those data points with insights in your content marketing personas, you can start to determine which content pieces are most likely to suit a user’s particular needs ­– and what it will take to move the user to conversion. When all is said and done, content should benefit the enterprise – not just the content department. Learning how to determine and present proof of content ROI is, perhaps, the most critical component of the content measurement equation. As I mentioned, to calculate ROI, you first need to determine the baseline costs involved in creating, distributing, and promoting content in your organization. As Michael Brenner points out, you need to factor in average production costs to the business – including copywriting fees, design services, use of tools and technology systems, and team resources – as well as estimated costs associated with content utilization and performance. 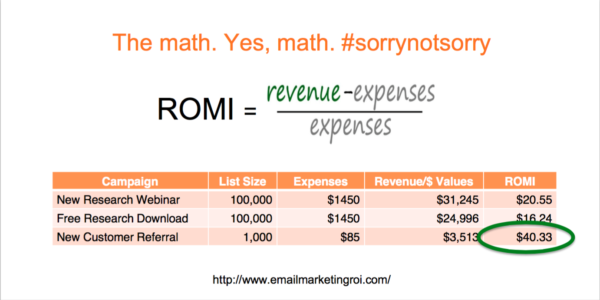 However, if you look at content marketing from a campaign standpoint, a more straightforward way to demonstrate the business value your content provides is to follow the basic technique Jessica Best outlines for proving the return on marketing investment (ROMI) of an email campaign. Jessica’s approach simply calculates marketing dollars in and marketing revenue out rather than factoring in the business’s overall cost of goods: Take the amount of revenue an average campaign generates, subtract your expenses for creating and delivering that campaign, and then divide the result by your expenses. Of course, if your content marketing program is more sophisticated and well established – or you have dedicated data scientists on hand – you may want to invest more time and effort in your ROI determinations. This collection of templates and techniques for tying your content to revenue can help you start off on the right foot. Once you’ve worked through all the steps of planning, building, executing, and evaluating your content marketing program, there’s one last thing you need to do: Go back to the beginning. No, you don’t need to redo all the work, but periodically revisit the strategic choices initially established and make any necessary adjustments based on the lessons learned throughout the process. Only by treating content marketing as a cyclical and ever-evolving process can you truly keep your program running at peak levels of performance over the long term. 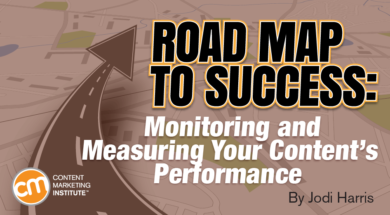 Make sure your content marketing road map includes a stop in Cleveland, Ohio, Sept. 4-7. Register today for Content Marketing World. Use code BLOG100 to save $100.